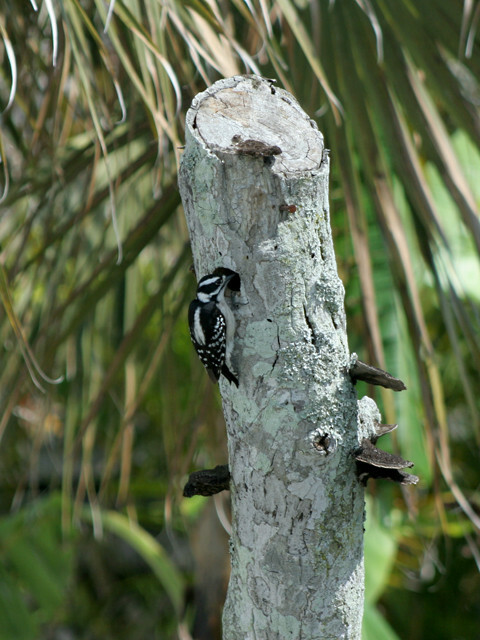 Mrs. Downy Woodpecker: Oh sweetie, I just love our new place! Our hard work has finally paid off. I can’t wait to move in and start a new family. Let’s get frisky up here on top of the roof and start making babies. 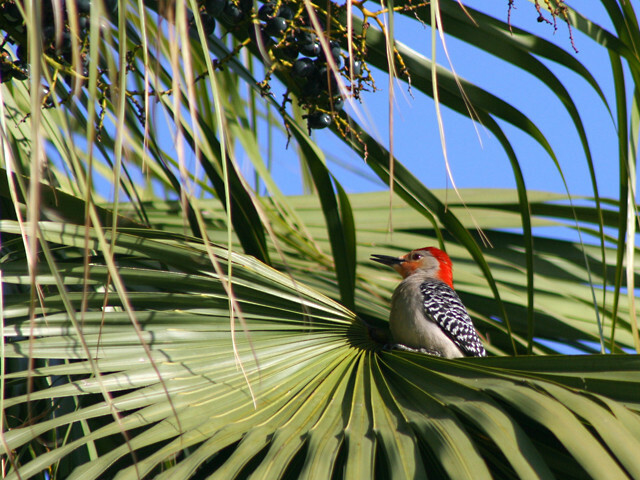 Red Bellied Woodpecker: Wow, this yard is very posh. It has an All You Can Eat Asian Palm Nut Buffet. I think I’ll hang out for a while. Bluejay: Wow, this place is great! It has a birdbath in my favorite color! 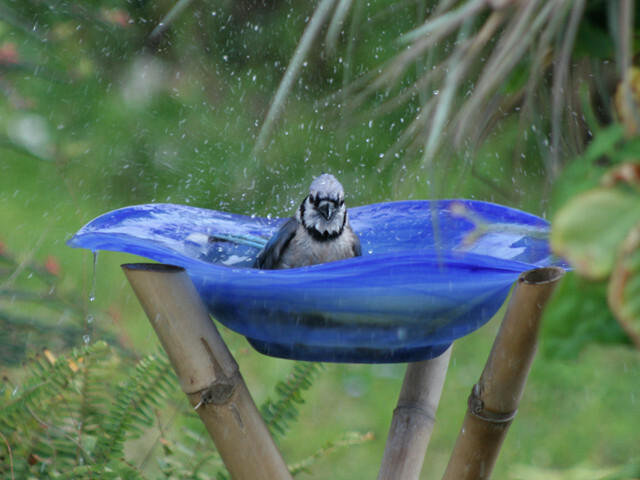 Bluejay: Um…a little privacy, please! Red Bellied Woodpecker: Hey, What’s this? A luxury condo and move-in ready. All I need to do is enlarge the doorway a bit. Good thing I didn’t waste my time building one of my own. 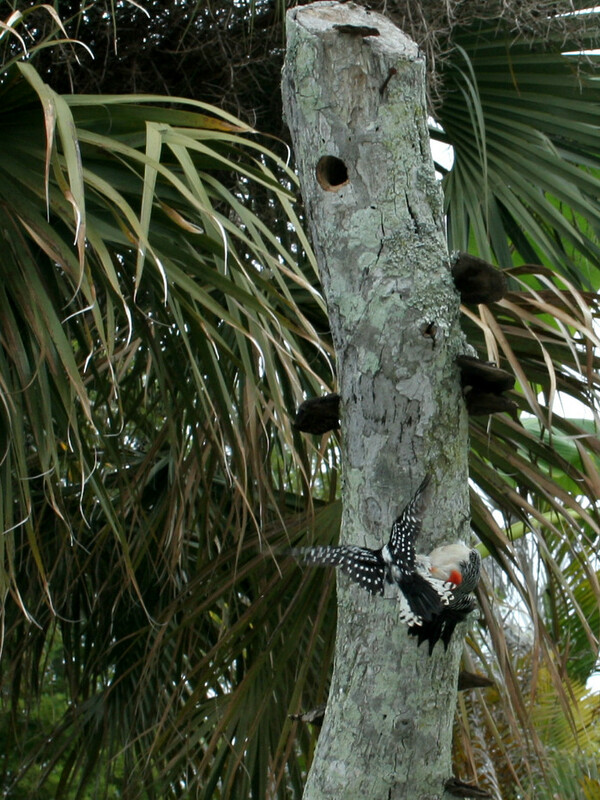 Red Bellied Woodpecker: Hey you little pipsqueaks, I’m taking over this place. Go get yourselves another. 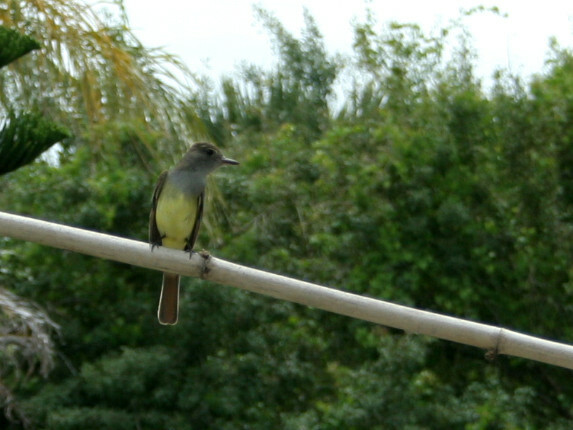 Great Crested Flycatcher: Hmmm, I wonder about this place. 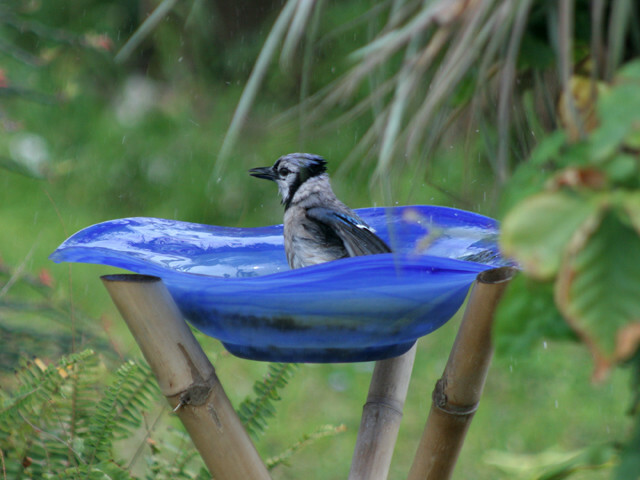 The perching is nice, and it has a spa, but the woodpecker neighbors are almost as bad as mockingbirds. I think I’ll look for quieter digs. Mr. Downy Woodpecker: Take that you evil home invader! 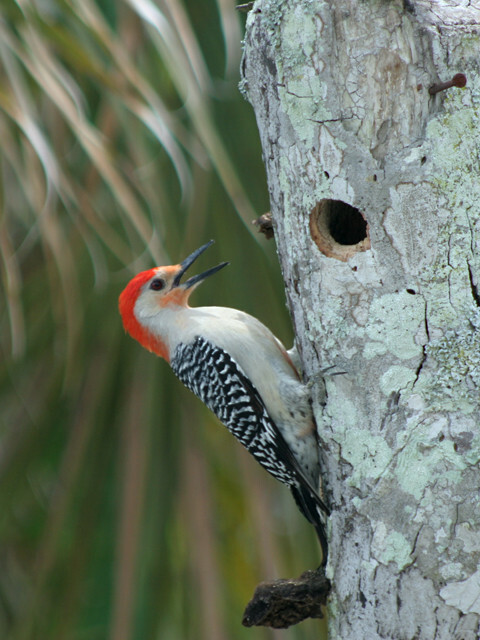 Red Bellied Woodpecker: Ouch! You’re pretty tough for a little guy. But I’m not leaving! 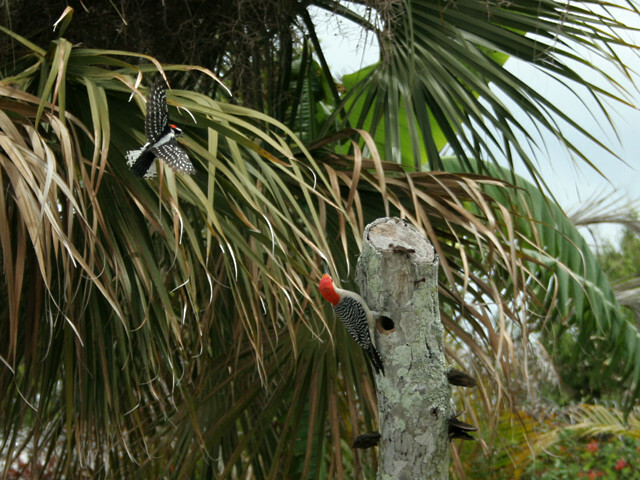 Feathers fly and little woodpeckers strive to defend their abode. 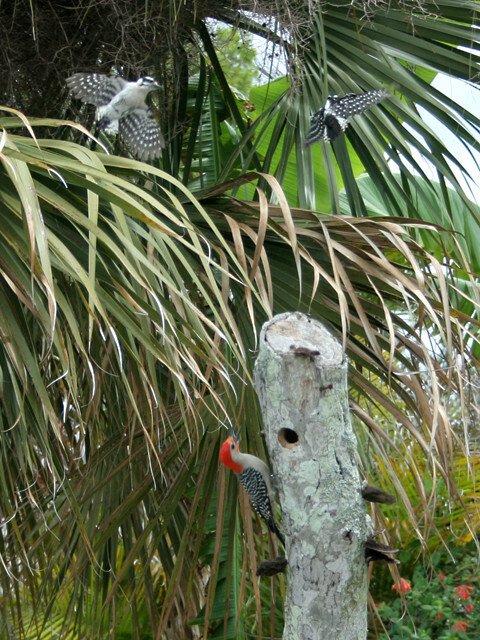 The Red Bellied Woodpecker is unflappable. A stupid human interferes with the natural order and tries to chase away the big invader by squirting with the hose. 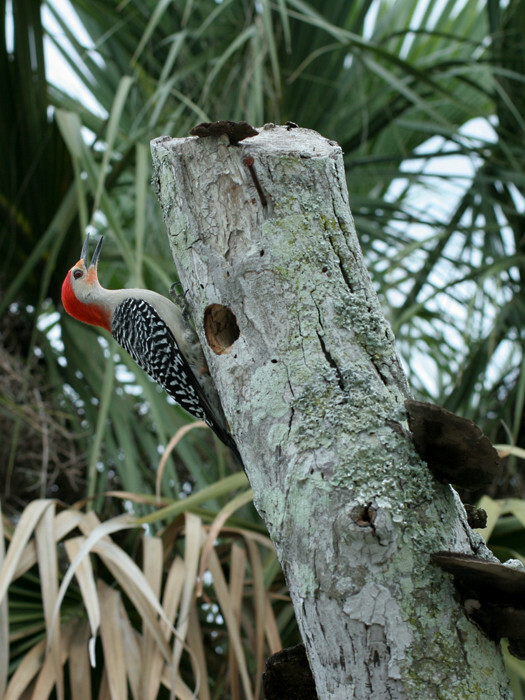 The Red Bellied Woodpecker returns again and again. The Downy Woodpeckers pant with exhaustion but refuse to relinquish their home. The next morning, the nest is abandoned. 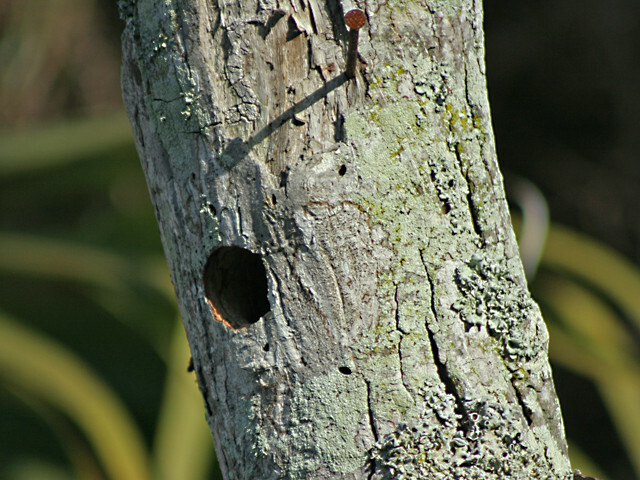 No baby woodpeckers in our yard this season. The meddling humans lose!